At the IAAF Combined Events Challenge meeting in Götzis, European junior champion Nafi Thiam smashed her own Belgian record by adding more than 210 points to the PB she set when winning the European junior title in Rieti last year. The Geography student tallied 6508 points to finish 5th, while in the men’s decathlon World University Games gold medalist Thomas Van der Plaetsen placed 6th with 8184. It was a superb two days of competition for Thiam who had personal bests in the 100m hurdles (13.81), high jump (1m93), shot put (15m03), 200m (24.78) and javelin (51m90). Thiam, a first time participant at the 40th Hypomeeting in Götzis, was voted ‘Rookie of the meeting’ and won the ‘Hypo Cash’ prize thanks to her 1m93 clearance in the high jump, together with the 22.35 200m clocking by Dafne Schippers the best performance in a single event. The win went to Britain’s Katarina Johnson-Thompson (6682) ahead of last year’s winner of Canada Brianne Theisen-Eaton (6641) and Dafne Schippers (6545) of the Netherlands. Nafi’s new NR score ranks her 5th in the world this year. World University champion Thomas Van der Plaetsen had a decent first day in the men’s decathlon which was highlighted by personal bests in the 100m (11.04) and the shot put (13m65) and a winning jump of 7m68 in the long jump equaling his PB tally of 4224 after 5 events. On Sunday Thomas posted a modest 14.76 clocking in the 110m hurdles and threw 39m63 in the discus. His 5m16 clearance in the pole vault delivered his 2nd win in a single event. He finished off with an acceptable 60m92 effort in the javelin and a 4:35.09 clocking in the 1500m. His total score of 8184 is 71 points below his personal best tally which he scored at last years IAAF World Championships in Moscow. The deacthlon was won by American Trey Hardee (8.518 ) with Germany’s Kai Kazmirek (8.471) and Rico Freimuth (8.317) taking 2nd and 3rd respectively. 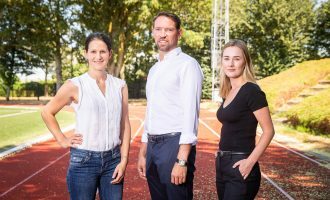 This year’s main focus for both Thomas and Nafi are the European Athletics Championships which are being held in Zürich from Aug 11-17.
is the first female athlete to join the team of Richard Mille athletes. . .